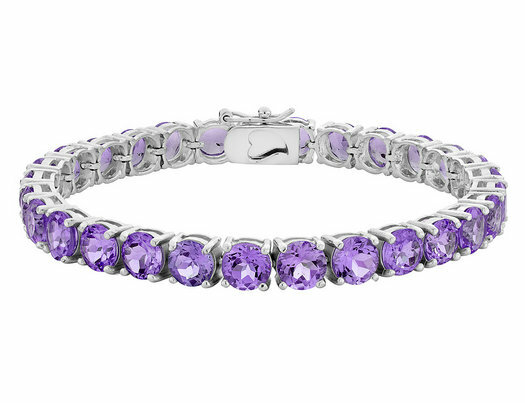 This stunning bracelet displays twenty-eight radiant amethyst gems, for a total carat weight of 8.0 (ctw). The lovely purple amethysts, the traditional birthstone for the month of February, are set in crisp sterling silver to highlight their beautiful color and sparkle. The bracelet fastens securely with a hidden box closure which features a delicate heart detail. Your review has been sent to us and will be posted pending an editorial review. Sorry. There was a problem while sending your review. © 2016 Gem & Harmony. All rights reserved.